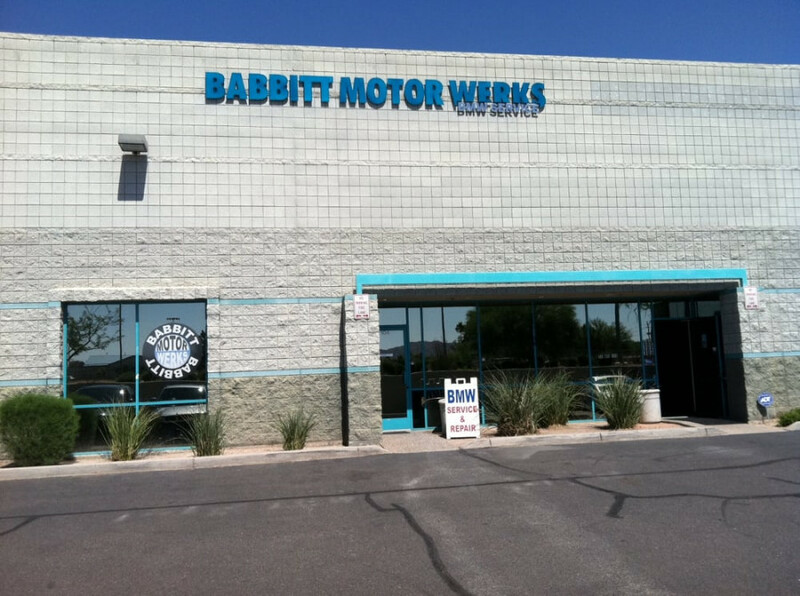 Babbitt Motor Werks in Tempe, AZ is exclusively an Arizona BMW Repair shop. We currently have 3 BMW master techs who previously worked at Chapman BMW, we have all the latest BMW repair and diagnostic tools including a GT1 and a SSS programming and coding station. We provide dealer level BMW repairs and BMW parts at a fraction of the cost. 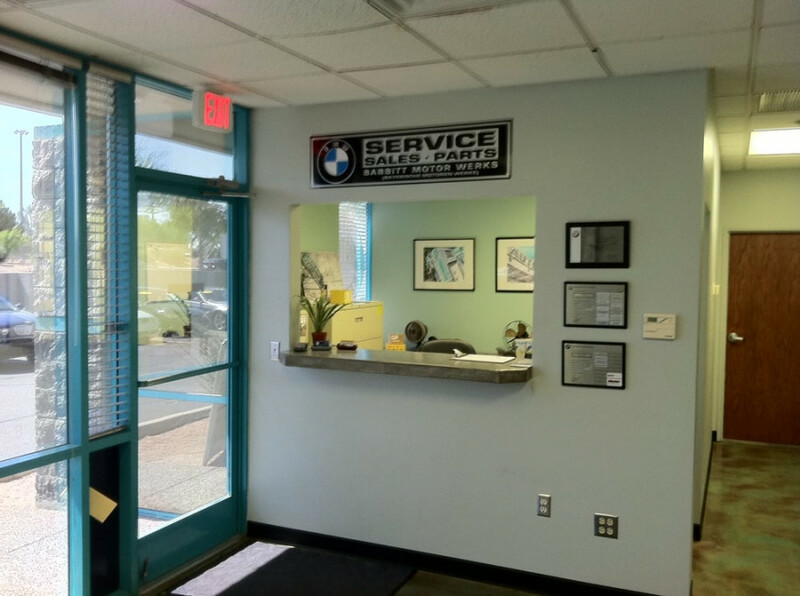 We proudly provide Phoenix BMW repair, with two locations to serve you: our Mesa BMW repair shop and our Tempe BMW repair shop. You can read our Tempe BMW repair reviews below, and click here to read our Mesa BMW repair reviews. All Babbitt Motor Werks technicians are graduates of Universal Technical Institute and were accepted into the BMW STEP program upon graduation. Additionally, each technician is BMW MASTER CERTIFIED. In order to obtain this status, the technicians attended the BMW Service Technician Education Program and clocked over 720 hours of training through this specific program. Babbitt Motor Werks - Tempe, replaced the motor mounts on my car. Great service, excellent staff, and as good as, if not better, than a BMW Service Center. Very Satisfied. It's not often that you hear "you just don't need that item right now Jason T"...well time for a change...Brad and the guys at Babbitt Motor Werks are awesome. I've priced some shops for my 2008 128i and for each major service in question, Babbitt quoted the lowest. Big bonus points for the excellent service, spotless work areas and the great car wash! I took my 2008 335i to Babbitt Motor Werks for the first time. Friends had recommended Babbitt to me in the past so figured I would check them out. Had my rear brakes and rotors done as well as a brake fluid flush. Brad at the Tempe location was polite and helpful and the cost of the work was what they had quoted me over the phone. Will definitely return when I need BMW service done again. Always solid. I can always count on Brad and Dane at Babbitt Motor Werks to be fair and honest. These guys always take care of my 2002 E46 with 190k for the past 4 years. Brad is friendly and let's you know details of any problems they find vs the dealership just throw numbers at you. I used to go to the dealership, and once the engine light came on and they tried to tell my wife that the fix would cost over $5k and tried to sell her a new car. Babbitt Motor Werks took a look and fixed a small hole in a hose and got everything back in ship shape for under $400. ALWAYS USE BABBITT! 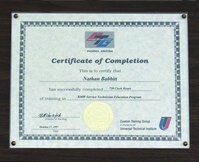 We have used Babbitt Motor Werks to service our BMW for several years. The service is always quick and reliable. The staff at the Tempe location was very friendly and we appreciated the fact that the car was kept under roof (especially in the brutal Arizona Summer heat) while being serviced. The turn around time was very fast and the car was returned washed! GREAT! Just purchased a BMW yesterday and had seen that Babbitt Motor Werks was highly recommended here and had them look over the car this morning at the Tempe location. Very impressed with this shop, estimates are fair and went out of their way to show me exactly what they recommended and what the estimates were for. Will be doing all future service through them and would highly suggest if you have a BMW that you make this your go-to shop. I was skeptical at first to take my BMW 325 XI to a non BMW service center but after spending a morning with Babbitt Motor Werks, I must say that I was beyond impressed. Dane and Nathan were polite and fun to interact with, very polite and very well knowledge in BMW. I had originally taken my car for a check engine light and they were able to solve the problem right away, also they informed me about a future breakdown on a part and saved me money by letting me know and replacing it. They brought me a new part and my part and explain to me where the issue was and even though i didn't ask them, they took the time to let me know exactly what was wrong. I also witness their interactions with other customers and was impressed with the consistency in their behavior. I've been looking for a BMW shop and now I have found them! Thank you Nathan and Dane for the wonderful experience! I recently had my 335i serviced and the price was great compared to the dealership. I also didn't have to wait all day, which I had to do when I had previously taken it to the dealership for the exact same service several months ago. I had arrived in the morning and within 1 hour I was on the road again. They also found out that I had a bulb that needed to be replaced. They did it and just charged me the price of the bulb. I want to thank Dane and Babbitt Motor Werks for providing me an alternative to the high priced dealership. I had recently purchased a 2000 BMW 528i. After buying the car I noticed a gas smell. I immediately brought the car into a BMW dealer for analysis. Not only did I have a gas leak, but the analysis came back with over $4000 in repairs. I was in shock. I had heard from several folks about Babbitt Motor Werks in Tempe. One of the friends had told me he drove all the way from the West side in Phoenix because no other BMW shop was expert on BMW's like Babbitt Motor Werks. Another friend told me they did stellar work and were realistic in their pricing. I took the car into Babbitt, I spoke with Nathan the owner and Dane. The service was far beyond what I had expected. The work was indeed stellar as I was told. These guys know their business. I had such a sense of relief after speaking with them. They assured me that the things I needed done on my car were normal repairs based on the mileage. After getting the car back you could tell right away that there were major improvements done. Dane had detailed out all of the work that was completed and went over it with us line by line. To say we were really happy with the work is an understatement. Excellent work, fair/reasonable pricing and good quality customer service...that's all you can ask for from any company you do business with. Five stars for Babbitt Motor Werks! Eric at the Mesa shop is always so helpful and professional. He gets my car in despite a busy schedule and the guys work hard to get it done the same day. He has stayed late to accommodate a late pick up and they go out of their way to insure that I am satisfied with the work. I heartily recommend Babbitt Motor Werks to anyone who owns a BMW. Babbitt Motor Werks has been my BMW's best friend I have repaired my BMW at both locations at the Mesa location and recently at the Tempe location. All times have been great experiences. I found Babbitt Motor Werks through google since I was looking for a place that specializes on BMWs that can find a major oil leak I had in my BMW, I took it to several places even the BMW dealership and they were charging an arm and a leg just to tell me where it was leaking from. Then I took it to Babbitt and they were able to find where it was leaking from right away, (valve cover) provided in-house rental service, but they were able to fix it in a matter of hours, power washed my engine, and the entire car first experience was unbelievable. And this last time I took it to the Tempe location for a radiator/hose leak and received the same treatment or even better, great customer service by Dane Nelson, followed up with me with price of the work order, and an estimate on other things that need to get done on my BMW...service is so good I even like them on Facebook! The first time I came to Babbitt's I was having issues with a strange clicking noise when steering my M Coupe at slow speeds. I thought of a hundred possible expensive issues. I called Babbitt's they told me their Techs could possibly pinpoint the problem by hearing the noise it was making as long as i could replicate it for them. I had called two other shops in my area of uptown Phoenix and none offered to do so. Not too mention the previous owner had recommended them to me as well. I came to babbitts, they took a quit look at my car told me it was possibly a bearing, they inspected it and it turned out to be an issue with my TC Kline suspension needing to be lubed up. They took care o the cracking sound in less than an hour and only charged me for half of an hour of labor. Too add to it they also washed the car for me. Great honest guys. Today i took my car for an ac charge and for the second time my total cost has been a lot less than the already fairly priced estimate, this is the only shop I have had that experience with. Today was extra amazing as they also gave me not one but two free Babbitt Motor Werks T shirts that I absolutely love. Best BMW independent repair shop in Arizona. Thanks guys for all the help. I absolutely recommend Babbitt's to everyone. Owning my third BMW out of warranty I have not had a better experience with any dealership or other BMW repair shop. So far I've been to Babbitt Motor Werks in Tempe twice. Both times have been great experiences. The first time I came to Babbitt's I was having issues with a strange clicking noise when steering my M Coupe at slow speeds. I thought of a hundred possible expensive issues. I called Babbitts they told me their Techs could possibly pinpoint the problem by hearing the noise it was making as long as i could replicate it for them. I had called two other shops in my area of uptown Phoenix and none offered to do so. Not too mention the previous owner had recommended them to me as well. I came to Babbitts, they took a quit look at my car told me it was possibly a bearing, they inspected it and it turned out to be an issue with my TC Kline suspension needing to be lubed up. They took care o the cracking sound in less than an hour and only charged me for half of an hour of labor. Too add to it they also washed the car for me. Great honest guys. Today i took my car for an ac charge and for the second time my total cost has been a lot less than the already fairly priced estimate, this is the only shop I have had that experience with. Today was extra amazing as they also gave me not one but two free Babbitt Motor Werks T shirts that I absolutely love. Best BMW independent repair shop in Arizona. Thanks guys for all the help. I absolutely recommend Babbitt's to everyone. Owning my third BMW out of warranty I have not had a better experience with any dealership or other BMW repair shop. I have a Mini Cooper that I purchased in North Scottsdale - when that was the only Mini Dealer around. It was so inconvenient to drive up there when I work in Ahwatukee. I found out about Babbitt and haven't been dissappointed yet. There is now a mini dealer right near my office but I still go out of my way to go to Babbitt. They are very reasonable cost wise - my oil change cost me about $50 less here than at the dealer. Additionally, I brought my car in 100% sure that I needed breaks - they called me up and told me I was wrong - and didn't charge me a thing to take a look. Every time I bring my car in they are sure to explain everything to me and show me parts that are worn out if they told me they had to replace them. I have no idea what they say half the time but it makes me feel better to know they are willing to share that with me! Anytime I have the smallest of questions they are great about explaining, looking and being helpful. I will continue to go to the Tempe location as long as I own my mini. Babbitt Motor Werks are honest people, they don't try to rip you off. Done only necessary work in BMW. Thank you Nathan Babbit for your amazing customer service! First let me say I'm done with the dealer, my 06 325 has always been to the Chapman and since my warranty ran out it seems like they always find something worng when I go in for any service due. Not getting the best feeling from them I decided to look for an independent shop (one qualified to work on bmw) one I could trust and have a more personal experiance with. Low and behold one day a card was left on my vehicle for Babbitt Motor Works, so I brought the vehicle in for my micro filter, whice was the service due. Basically I have nothing but wonderful things to say, the service advisor was clear and very poilte dealing with all my questions. But most importaint was the price almost 50 dollars cheaper for that stupid filter. love them they have my buissness for life. Nathan is an outstanding BMW mechanic. He is thorough and has many years of experience. His pricing is also reasonable and he does not try to sell a customer on a service that they do not need. I couldn't agree more with the other comments posted here. I found Nathan when a friend recommended him. My car had just gone off of service contract and I wasn't sure if I would keep it. Nathan gave me honest and reliable feedback about what I could expect in the coming years so that I could decide if I wanted to keep the car or sell it and buy a new one. He did my repairs right the first time, and as everyone else mentioned, he was great about explaning the issues, both long and short term. He helped me decide which repairs were critical and which were not. He was never pushy. If you are going to keep your car out of contract and don't want to pay for the impersonal, and lacking in personal ownership, service of a large dealer then you should consider Babbitt Motor Werks for all of your BMW service need. Babbitt Motor Werks is the BEST BMW repair shop you will ever find. Trust me. The first time I serviced my 650i, I made the horrible mistake of taking it to Chapman BMW. Not only did I spend a half hour being passed around on the phone like a monkey trying to set up an appointment, I spent three hours waiting for them to "service" my car (i.e. change my oil). My old and wise neighbor recommended Babbitt Motor Werks in Tempe, so I I gave them a call the next time I needed my 650i serviced. Within two minutes, I had an appointment time set up with them, an estimate on how much the service would be (half that of the dealership), the amount of time it would take (no more than forty-five minutes) and the priceless feeling that I was in good hands. When I showed up at Babbitt, the friendly owner greeted me by name and had my car in the shop within minutes. I was then led inside to the very modern waiting room, where a plasma screen TV, leather seats, ipod speakers, and free waters and candy awaited me. Twenty minutes later, my car was ready. They even washed and vacuumed the car at no extra charge. I couldn't have asked for a better experience. Period. I will ALWAYS take my BMW to Babbitt Motor Werks and would HIGHLY recommend them to anyone who appreciates top of the line service, the best prices, and some of the friendliest mechanics around. I have an M3 that was due for an inspection 2 service, and check engine light was on. I called a few shops around the valley, and felt comfortable with Nathan at Babbitt Motor Werks. When I arrived I was a little skeptical. It is a small operation, but Nathan seemed really knowledgeable about BMWs. He has about 30 BMW certifications from BMW so I figured I would be safe. He had the car done that same afternoon, I was shocked at how fast he performed the service. Well I payed him 500 dollars for the inspection, and I truly felt a huge improvement. Engine runs so smooth, engine no longer ticks, and acceleration seems to be restored. I'm a happy camper. Will definitely be back. This is truly a small BMW repair shop but it means he can dedicate all his time to your car. I had him do head gaskets on my 1998 740il. He saved me hundreds of dollars over the dealer and a couple other indy. shops! I just wish I knew about Babbitt Motor Werks for my last car that I had to donate to Goodwill because I couldn't afford to have it fixed. Well its been a couple weeks since it was finished and it's still running better than it ever did! thanks again everyone at Babbitt Motor Werks. Just wanted to leave some input on your business. I live 2 1/2 hours from Babbitt Motor Werks and I still bring my BMW to Babbitt to be worked on. People at Autobahn are very fair with their quotes and also are very knowledgeable when it comes to working on my cars. I have sent a couple of my friends too. Anyone else that needs service for their BMW I would highly recommend. Thanks to people at Babbitt Motor Werks for your honesty, you don't see that very often. I have a 2004 X5 that had a very strange noise. The dealer wanted to replace multiple parts to try and correct it. Nate said he would look at it and found only one part was bad. Thanks for your honesty! I used to think that going to the dealership was the only option for getting my BMW serviced because i didnt want some yahoo working on my car out of some shop, but i have found several flyers for Babbitt Motor Werks put on my window so I figured why not give them a chance, and scheduled an oil service with Nathan at their Tempe location, which is in the middle of the 10, 101, and the 60. I showed up for my service expecting to be there for about an hour, but was very surprised when they brought my car up front 25 minutes later, and the hand car wash they gave with the service was outstanding! Babbitt Motor Werks has certainly changed my opinion about going to non dealer to get my car serviced. Nathan and his crew at the new Tempe location are great! I was incredibly grateful for his expertise; I love my BMW and trust Babbitt Motor Werks to work on it. He also was so kind to help me work out a deal to keep costs low in this economy. Highly recommended! They are simply the best.